Customized solutions to support member health and value based care. The ACE Approach is centered on closing known industry gaps in care management – and unlike anything found in the healthcare industry today. In developing the ACE approach, extensive industry research revealed key opportunities that were major considerations in the development of our unique four-prong approach. Health reports delivered to Providers. Increased Member engagement thanks to targeted campaigns. Enhanced contact with hard-to-reach members. Care is followed across the medical-behavioral spectrum. Comprehensive solution to Value-Based care. Unlike anything you will find in the healthcare industry today. Proprietary risk stratification algorithms apply decision-probability logic to drive actionable, real-time interventions. ACE utilizes our internally developed, proprietary technical platform for risk stratification and scoring. This platform goes beyond the typical high-cost, high utilization approach, taking a member’s past and present health conditions and comparing them to historical records from millions of other patients with similar health conditions. Results are used for risk scoring and to form patient cohorts based on similar clinical and financial risk. This process allows for a targeted care coordination approach and maximum results. A seamless, bi-directional EMR inclusion for sharing of patient information to identify quality improvement and risk capture opportunities. Whether you are a member, provider, health plan or hospital, imagine if you had dedicated resources reviewing your overall health, analyzing it and then handing you a report showing how to improve it. ACE does just this! ACE delivers health reports to our primary care network identifying quality improvements in care, such as a missed retinal eye exam for someone dealing with diabetes or a reminder to schedule your annual wellness exam. ACE health reports utilize real-time data analytics to recommend focused interventions, thereby driving quality up and costs down. And, if this sounds like it may be hard to incorporate into practice, don’t worry, our process is seamless, occurring in the background due to our platform’s integration with electronic medical records. Further, ACE has built a team of tech-savvy individuals, all with backgrounds in EMR implementation and integration who will ensure your EMR is capable of communicating directly with ACE instead of burdening your staff with data entry into multiple systems. Quality based campaigns allow ACE to evaluate physician performance with regard to HEDIS measures. ACE offers a comprehensive solution to value-based healthcare through the use of targeted campaigns. Campaigns are centered on high-tech, high-touch member engagement for your hard-to-reach and high-risk members. ACE campaigns identify members who are missing care critical to their health. Designed to support HEDIS quality metrics, campaigns focus on basic, yet important aspects of care. For example, pregnant mothers in need of prenatal care or post-delivery care, children in need of immunizations, teens in need of social development or depression screenings, and adults in need of breast, cervical or colon cancer screenings. Shared Savings and Investment opportunities offered to our Provider Network, leading to a highly-engaged, well-coordinated physician team. 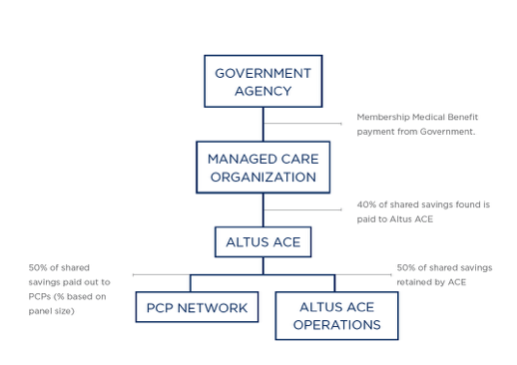 ACE offers a Shared Savings plan unmatched by our peers, with a model allowing for distribution to our Provider Network prior to reimbursement of expense to ACE.